It may correspond to multiplay, but may cause problems. At that time you will be saved if you send me a log. Fixed that Dagger of Luna dial could not throw. Fixed that Kris Knife could not fire magic bullets. Fixed that we could not guard with Damascus steel Great Sword. Fixed that the durability value did not decrease when guarding with Greatsword. Fixed a problem that crashes when used for obtaining light crossbow, heavy crossbow, repeater bow, crank repeater bow by command. Fixed some sound effects were not played properly. Allow to set the generation of vanadium ore by config. Please delete old config file. 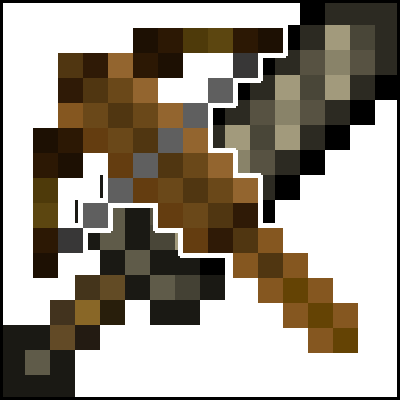 Added new weapon "off hand sword". The modification of the disarm of 1.10.2 edition and 1.11.2 edition went. However, disarm does not apply to mob of other mod or there is a possibility of trouble. I also did not reproduce the problem of Dagger, so please let me know if it occurs. The newest version, still mobs can pop high light level area. It becomes rare but sometimes occurs. Mob 's spawn condition is equivalent to vanilla. I think that it will not spawn in a bright place. I wanted to make it somewhat tough condition, but it was unpopular. It is judged that it is better to match with vanilla if it is combined with other mod. I'm enjoying this mod quite a bit. I was looking for variety in the weapons without being too overcomplicated, and this was perfect. The mobs, for me, are a nice bonus. Thanks for sharing this. Thank you for downloading. have fun! Your mobs can spawn on the ground that keeps enough the light level. so my cows were almost killed by lizards things and so on. Please stop spawn on safe grounds. It maybe relates sponge-forge issue. I will tell to sponge-forge forum. Changed the spawn condition of Mob. Those who have AI to attack the villagers try to spawn at night or in dark places. Please also comment if there is something. Mobs spawn sometimes on the ground that light level 12+. Is it correct? The 0.1.0 version update increased the production rate of vanadium ore. Mobs can spawn in the biome of "Biomes O Plenty". I could find Vanadium Ores! I set also Simple Ore Generator Spawn Rate to lower. It was maybe related. Thank you so much for Update! I was running underground with spectator mode for Vanadium Ores about 1hour. but, I could not find Vanadium Ores. ;( How about rarity? Rarer than diamond ore? The update increased the production rate of vanadium ore. It was confirmed that it was generated by "Biomes O Plenty". If it still does not appear, other mod may be interfering. I just used your mod in my mod pack! It is called Better Minecraft Adventures and you can check it out here. Thank you! I updated it to version 0.1.0 and want it replaced. Hey Iyamato, it seems like your amazing mobs are currently not spawning in Biomes added by the "Biomes O Plenty" mod, could you please make a compatibility fix?